Mighty No. 9 by Comcept had a rough development cycle, suffering from a series of delays and then a bumpy launch filled with performance problems and middling reviews. It's safe to say, the game didn't live up to expectations. As a result of these issues, the handheld versions appear to be stuck in limbo. The title was originally released on multiple other platforms, including the Wii U, in 2016. It’s since been over two years with no sign of the handheld releases - leaving backers in the dark. A minor delay was suspected when Comcept was acquired by Level-5 in 2017, but there's still been no update about the portable versions of the game, including the 3DS release. Destructoid has reportedly been attempting to contact Comcept for the past month and has had no luck getting a response. The game’s western publisher, Deep Silver, also refused to provide a statement about the current development status of the handheld versions. An effort has now been made to contact Mighty No. 9’s Japanese publisher, Spike Chunsoft. 3DS yes. Mainly because of the dreath of good new games for the system. Yes, Mighty No. 9 is not a 'good' game, but at least better than those cookie cutter games that get released on the 3ds eshop nowadays. 3DS version is actually nothing. I think at this point we can safely assume the handheld versions are cancelled. The game ran poorly on Wii U, they've been silent about these handheld versions for a year, the Vita is all but dead and the 3DS isn't exactly making waves... All that's left is to admit that it's cancelled. I mean, is anyone REALLY waiting anxiously for these releases? Mighty Gunvolt Burst is a much better game than any portable version of Mighty no. 9 ever will be. It's been a couple years now. I doubt they are doing them. Does anyone actually want this game on 3DS? @thesilverbrick I think the Vita and 3DS versions were backer rewards. Mega Man's big return as of late really didn't help this game's already non-existent chances. MN9 has hurt enough people already. Kinder to just pretend it never happened. I literally feel like an anime fan on prom night. I remember when Capcom canceled those two Mega Man games, MN9 was the big talk and so called Mega Man successor. But after all the mess this game has gone through and now Capcom is making a new Mega Man game now... MN9 is just, meh. Worst crowdfunded software project I've ever seen by far, and that includes Titanic Honor And Glory. Puts Team17's handling of PlayTonic's removal of JonTron from Yooka Laylee to shame. With Mega Man making a return as of late with all the Legacy Collections + the upcoming Mega Man 11, a mediocre Mega Man spiritual successor seems unnecessary on any platform, let alone a fading one like the 3DS. At this rate, they're probably going to tell the backers "look, we can't do the handheld versions anymore. Further resources will cost us more money and lose even more if we release it to zero fanfare even on digital stores, so we can offer you a free code to one of the other versions and all its DLC if you want", if they're allowed to assuming the handheld reward wasnt on top of a home console reward. @Zyph Ummmmmmmmm some people got rich maybe??? @Majora101 lmao why make a comment defending some farthole years after the fact in relation to an irrelevant news story. Mighty No.9 sucked, stick to the topic at hand! I emailed Nintendo Life quite a long time ago with this article suggestion, seeking to bring attention, being frustrated as one of the handheld backers that there hasn't been a word. Not even a blip or "pew pew" about a delay or cancellation. Glad to see the NL editorial staff is paying attention finally, but shamefully because another website was working on it. Anyway, I finally caved in a month ago when I saw the Wii U version in a bargain bin for $7.99. Couldn't wait another year to play this game. Here's hoping we still get compensation somehow. At least with a digital code for the console version, if they've given up? I still don't regret backing it as they did come through with the physical material and it was an attempt to bring forward a new version of the Mega Man to the masses. Capcom learned from it, as seen in Mega Man 11. It came out on some weird Chinese things, but never on 3DS? It should come out since backers paid for it, even if no one really wants it by now. Hey, @arekdougy. It's ok, reading comprehension isn't my strong suit either. No shame. You should finish your GED program so you can earn that community college liberal arts degree you've had your eye on. That way, you will be almost halfway towards achieving the fifth grade reading level required to interpret other internet comments you don't fully understand. But then again, maybe you shouldn't! The conversational value of topical similarities between two or more separate but topically similar subjects might make itself clearer to you before you expose the public to more eye-opening colloquialisms via hastily-typed 2am internet arguments beginning with an @ tag and "lmao" written in all lowercase (naturally). I don't know how I've gotten this far without what is now my favorite word of the year: "farthole"! Keep it up, my buddy! At this point, doing the 3DS and Vita versions would be nothing more than an appeasement to their obligation to the backers. The campaign promised far too much, and every platform suffered for it. A shame to think that it if maybe they waited a few years and released on a limited number of platforms using the same engine like Switch, PC, PS4, Xbox One, it could've been a more realistic end-goal. It was still sabotaged by a lot of other bad decisions though. The developers didn’t even offer me a complimentary steam code. It’s the least they can do for me and those who backed the game. Compare this to Shantae, which sent me the base game on the WiiU (as promised), a steam version (because the wiiu version was a little late), and an ultimate edition, for steam as a thank you to all backers. Keiji Inafune is a spiv, and I was a fool to trust him. Nope, not interested. I already have all the Gunvolt games which is a much better choice. But i feel sorry for the people who backed and are still waiting for it. They should at least get a code for another platform or a refund. @OdnetninAges yeah no idea why they don't let backers choose another game to get a download code of. I know mighty is $20 but it's a ripoff to do nothing and not explain, refund nor give away other games/versions. I backed the PS3 version, which included the PS4 & PSVita versions via crossbuy. They need to either refund those of us who got an incomplete transaction, or offer us a different game in it's place to make up for it. I already have the game on the other platforms, so a Steam, Wii U, etc. code would be completely useless for me. I'd be happy with an improved Switch port, but I'm not holding my breath. I think it's very clear that the handheld versions were quietly swept under the rug. As was Red Ash. I think it’s obvious that the 3DS and Vita versions have been quietly cancelled. Just let Inti-Creates have the IP-- They did more for the MN9 series alone than Comcept did helming the MN9 game itself and giving Inti-Creates orders. Clearly Inafune & co. are in shameful hiding, and rightfully so. This is why you don't overhype projects, especially crowdfunded. I know he wanted to pull a "Take that!" on Capcom, and I was pulling for him, but now it's Capcom with the last laugh. Karma is something else. I still remember seeing Inafune on stage hyping Mighty Number 9. Just thinking how I was happy I didn't back his game. @90sRetroGaming That's the thing about crowdfunding, especially on sites like kickstarter: The developers don't owe you anything. A friend of mine had the brilliant idea of backing a kickstarter to get a mocap-syctem for 900 bucks (because it worked out with the oculus rift before for him). If the game is a piece of poop, but it's on a handheld, does that mean that if I play the poop game while taking a poop it'll help me poop? 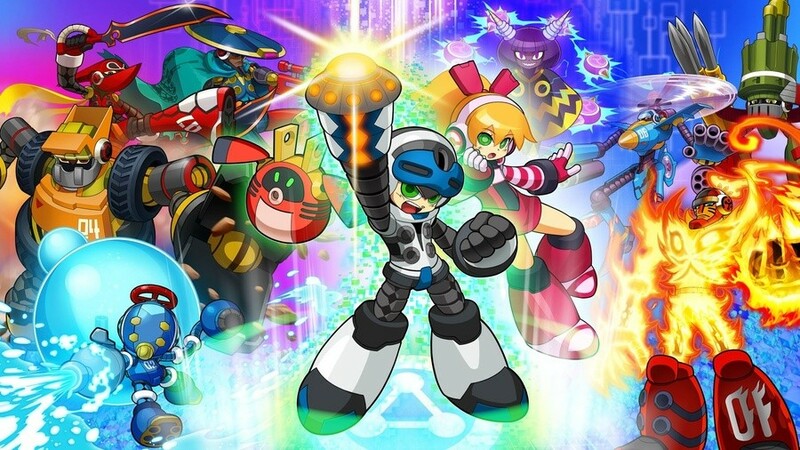 Comcept: So late the the party that even Capcom is making a Mega Man game before them. @Majora101 Your presumptupus and meandering insults to my level of education indicate a certain level of insecurity. More irrelevancy to (not) prove an irrelevant point. I hope you're having a productive and lovely day. @arekdougy Right back at you, buddy! Should I feel bad that I still would buy this if they released it on switch with a HEAVY discount??? @Decapre What kind of sandwich though;)? Cheese, ham turkey... Sound advice though. I like mega man, but mighty no9 does not sound good. @OdnetninAges lol better than nothing. But it is confusing with all these properties. Wonder what concept makes that is mighty and is theirs besides this scam? Lol: It won't happen since nobody is interested.